Let stand 24 hours in limewater. Take pickles out of limewater and rinse 3 times. (Put in fresh water in sink and rinse from side to side in a double sink - 3 times.) Let stand in clear cold water for 3 hours. Drain and wash cucumbers. Put in the following cold mixture and let stand overnight. You can add some green food coloring if desired. Next morning simmer all together for 35 minutes, put in sterilized jars, and seal. I usually put them in a cold packer and bring them to a boil. 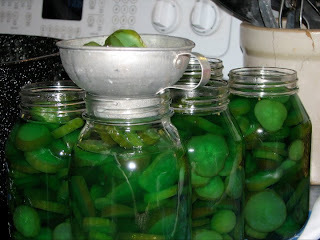 Remove and tighten jars. Jars that do not seal after a few hours you will need to refrigerate.